I don’t have many Heathers and I’ve tried to group them into a bed by height and size. For once the labels on them were pretty correct and I was able to put the biggest ones in the middle and the smaller ones at the edges, but I don’t prune these so they all are getting quite big and wild looking. I like the look myself. It reminds me of seeing the Heathers on the moors in Scotland when I was there in my teens. 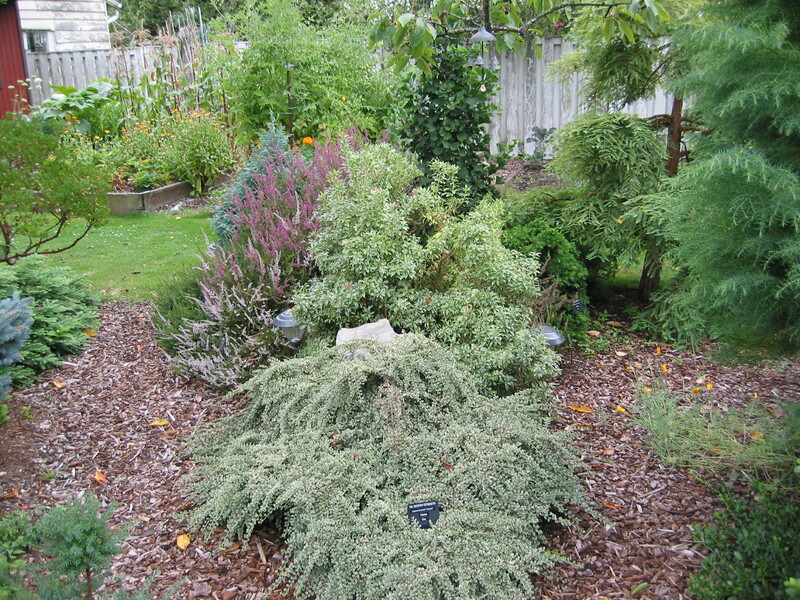 This shot shows the whole bed from the south with the Metasequoia at the left side and the Ginkgo in the middle and the Heathers in between them all. I’ll show more with other views of the Heathers. This one shows the Ginkgo Jade Butterflies in the middle of the bed, and also you can see the Carmina Heather on the left and the Irish Heath in the middle, as well as the Kerstin on the right edge and the Allegro in the top middle. This is a good shot of the Allegro, the biggest one I have. It’s gotten quite large and is as big as the Baby Blue Pisifera Cypress on the end. It’s in full bloom now. This one shows the whole bed from the North side. 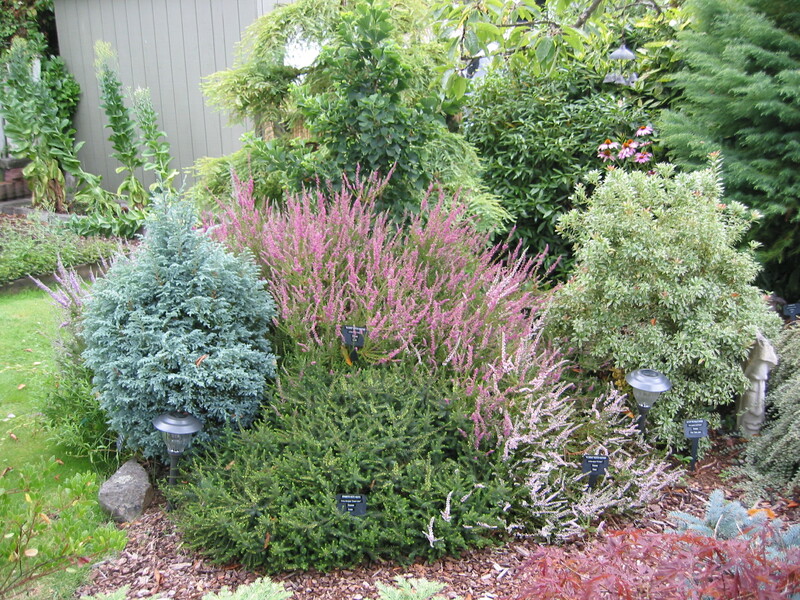 You can see the Rockspray cotoneaster on the end and the Little Heath Pieris in the center before the heathers. 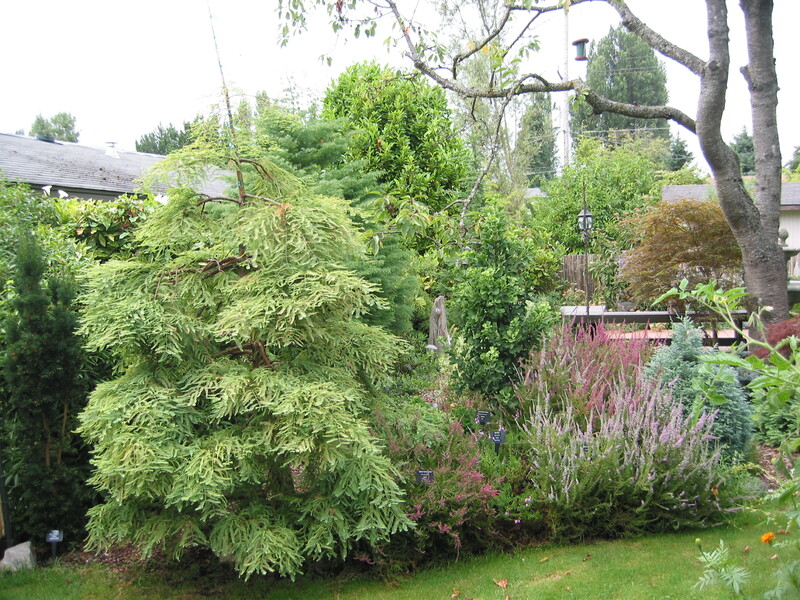 At the right side is the side of the Elegans Cryptomeria, and on the far left is a glimpse of the Manazanita, with the Veggie garden in the way back part. The tomatoes are Huge! 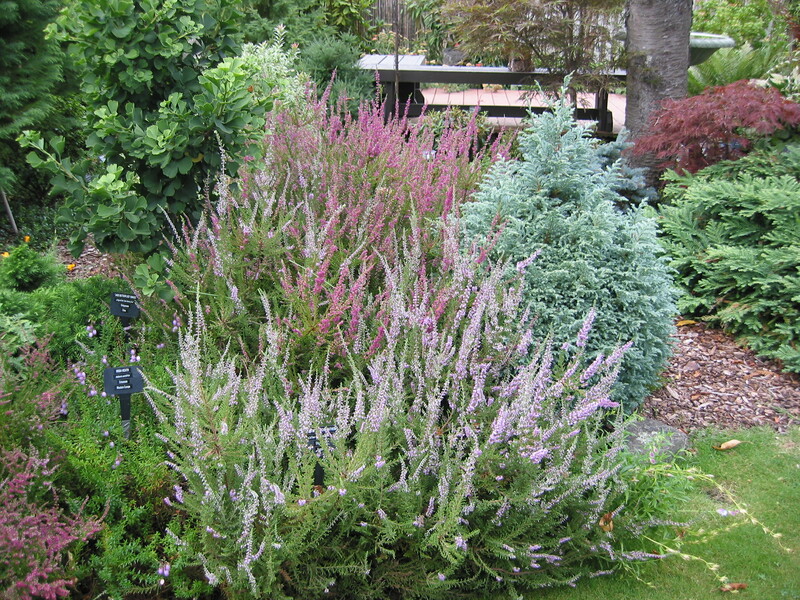 This one shows the one Heath in this bed of Heathers. It’s in the front and is a Kramer’s Rote which is covered in deep ruby red flowers in mid winter when all else is bare here. It’s lush green now setting off the flowers of the rest of them. On its right is a H.E. 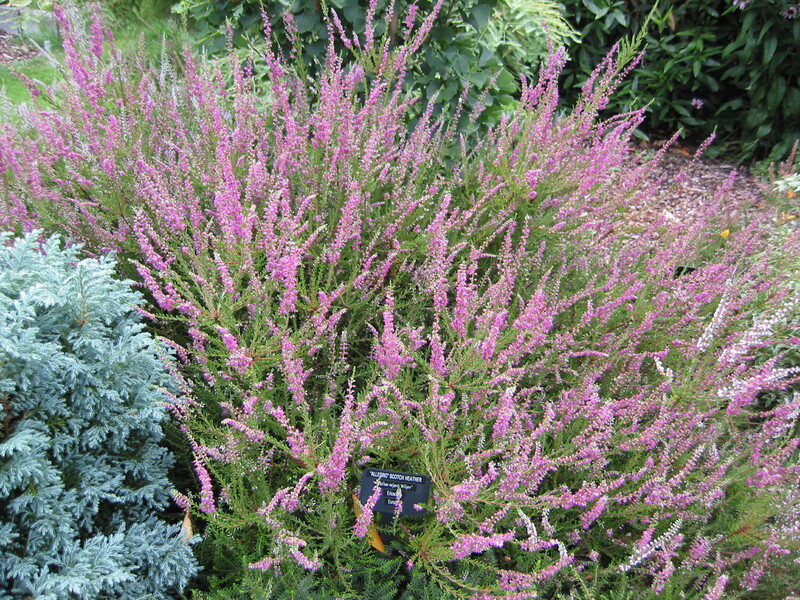 Beale Heather next to the Little Heath Pieris. You can just see the head sculpture next to it on its right. It’s covered up a lot by the growing together of the plants over the years. You can see a clear picture of it on the “Art” page in the permanent archives part of this blog. It’s pretty cool to have art sprinkled around in the garden. It adds a nice new dimension to it all. Here you can see the wildness of the Allegro in the foreground and an Echinacea purpurea in the background. It’s next to the Elgans Cryptomeria. 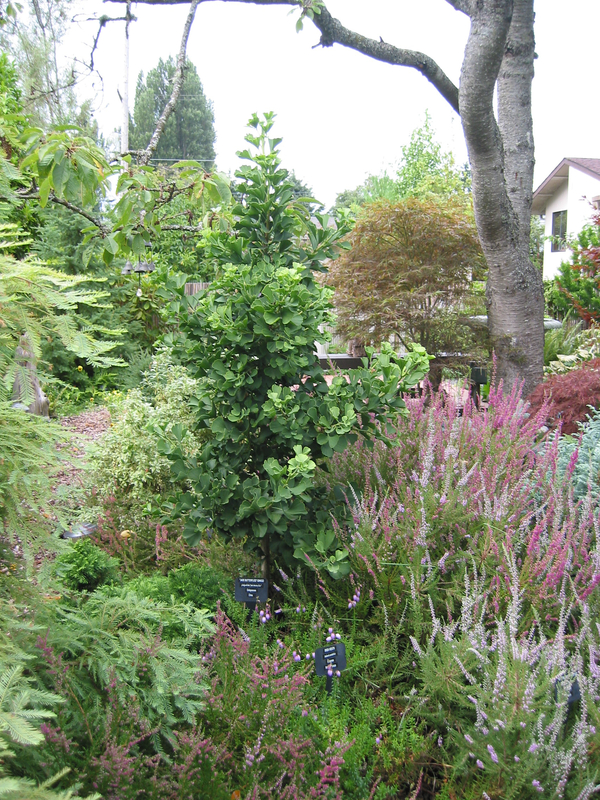 The Little Heath Pieris is on the right. The Gingko is on the left. This final shot shows the Kerstin on the front and the Allegro on the back with the Baby Blue Cypress on the right side edge. You can also see the Ginkgo on the left. And to the right edge is the Sequoia prostrate form I profiled recently. 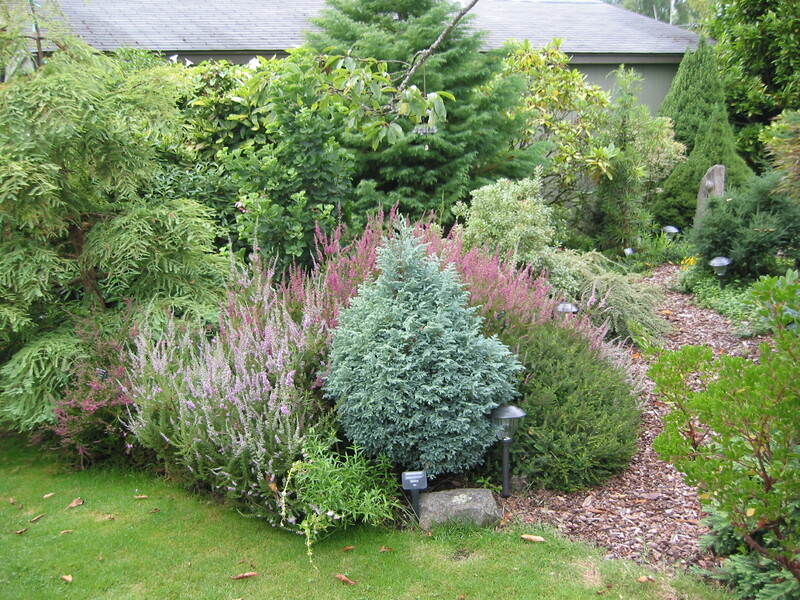 I know this isn’t much of a formal Heather Garden but it’s what I’ve got and l personally love the wildness of it all. I may prune them some this year I dunno but I hate to do it. It’s so interesting to see how big they actually get and if they’ll stay green throughout or lose their inner leaves as they often do when left like this. It’s a gamble I’ll admit but I think it’s a good one. It’s so delightful to see the many varieties of heater that I have in this small space. They all have a different look to them, some of them even turn color in the winter which is nice. It’ll be a thick bed as it already is and it’s grown so tremendously in the last 5 years it’s hard to imagine it was all so small so recently. 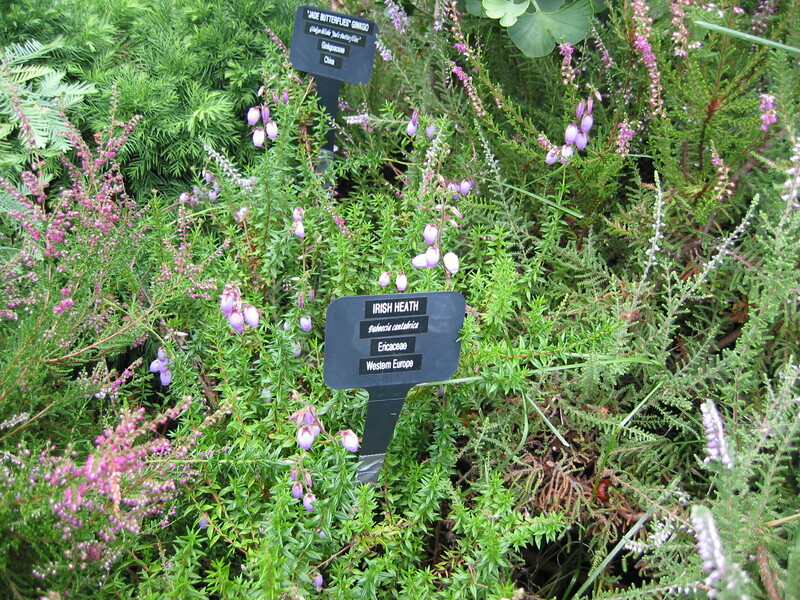 Our peaty soil does wonders for plants like this in the Heath Family. They really love it as you can see. It’s rich and full of moisture even on hot days so water is still required but not a lot of it. 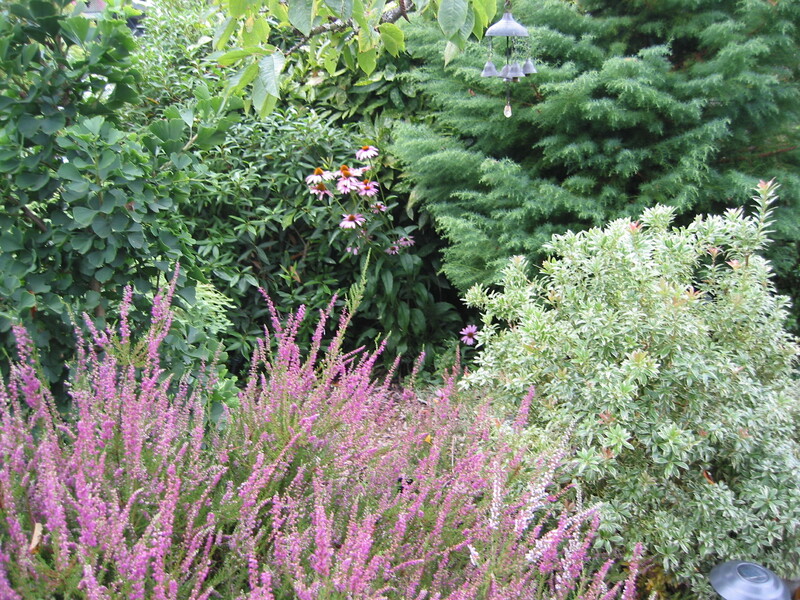 I’m very happy with this bed of Heathers and others, and hope it continues to grow well in the future. Thanks for taking the time to visit me here and see them!